Geelong Advertiser … where is it? The banner for the Geelong Advertiser includes the words “Fortis est veritas” or THE TRUTH IS STRONG. The Geelong Advertiser is Victoria’s oldest morning newspaper, the first edition being published on November 21, 1840. A mere 171 years ago today, the Geelong Advertiser included a supplement to the (then) standard 4-page issue. 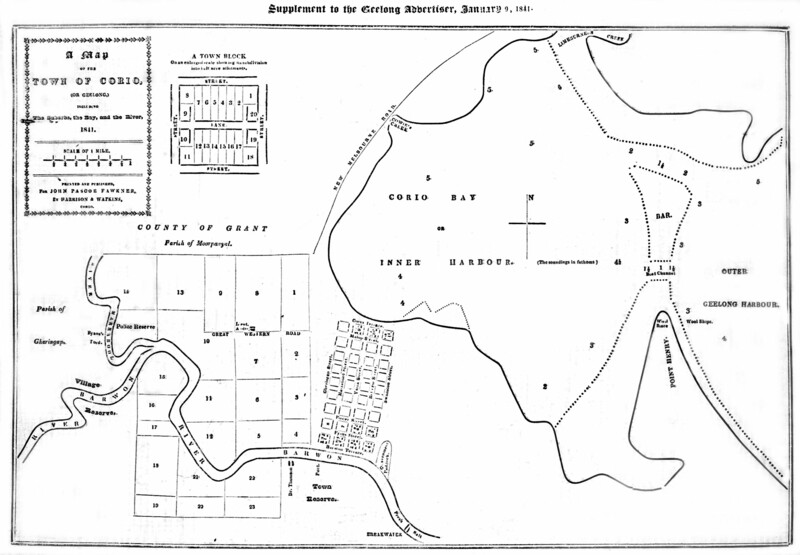 The supplement was this amazing “Map of the Town of Corio (or Geelong) including the Suburbs, the Bay, and the River, 1841 … printed and published for John Pascoe Fawkner by Harrison & Watkins, Corio”. Today I published a blog to announce that we had achieved more than one million records in our Geelong & District database. This amazing effort is due to a heap of volunteers who have just one aim – to help others research their family and local history – a totally unselfish attitude by all involved. I’m CROSS – and it’s time I got on my soap box. ANYONE with an ounce of history running through their veins knows how much history exists in our region. I have given presentations all over Victoria and also in New South Wales, South Australia and the Northern Territory. Many have been on Geelong and Point Henry (the place of arrival of so many ships bringing immigrants to our shores) but the majority have been on other local and family history subjects. Without fail the majority of the audience had ancestors who arrived in Geelong / Point Henry. In June 2011 I gave four presentations to the Genealogical Society of the Northern Territory [GSNT] – almost 100% of the audience had Geelong connections! and possibly the National Library of Australia, although it doesn’t appear in their list of libraries holding the Geelong Advertiser! Of course, being the LONGEST RUNNING morning newspaper in Victoria AND the newspaper covering not just Geelong but all of the western district of Victoria [and across the border into South Australia] you would think it would be a high priority to be included in the wonderful Digitised Australian newspapers web site. So what’s missing? GEELONG ! If the Geelong Advertiser was digitised this list of places would double as it covers so many towns and districts in Western Victoria. Verbally we’ve been told that if the Geelong Advertiser was digitised it would gobble up the annual newspaper digitising budget for the State Library of Victoria and that wouldn’t be fair on every other area of Melbourne and Victoria. But is that fair on Geelong and half of the rest of Victoria? What pre-1850 Victorian newspapers have been digitised for the NLA site? That’s it! The Port Phillip Herald was digitised some years ago and is available [not free] as part of the Paper of Record web site, hence the reason it’s not included on the NLA site. Did you know that the Geelong Advertiser published lists of people who shipped gold from the gold-fields to the port of Geelong in 1851-54? We have 6,624 entries in our Geelong & District database for the gold shipments. In fact our database includes 29,413 entries transcribed from various editions of the Geelong Advertiser on a variety of subjects. There is no argument … the Geelong Advertiser should be digitised as part of the National Library Digitised Newspapers project. I’m an individual – I can’t do it all [apart from working 5-days a week] – but let’s get something moving! OK – that’s my soapbox all worn out for now – come on everyone, come up with ideas and actions to help get the Geelong Advertiser digitised for the benefit of ALL researchers. P.S. I almost forgot to mention that some issues from the first five years of the Geelong Advertiser were digitised as part of the Australian Periodical Publications 1840-1845 project. It’s available online as single page downloads however it’s not searchable. Next Geelong Advertiser … update! A great rant! And entirely justified. Could I suggest you send it to Richard Marles without delay. Message just sent on his contact form! And I’m more than happy for anyone to forward a link to anyone you think may help support us! Well done Susie, I have often wondered why and when it would appear on TROVE. How about a “letter to the editor” for publication in the GA to get the general community interested. Hi Liz, a couple of emails have been sent to relevant journos and guest editorial writers. One idea is to get the Addy to start a subscription fund that people could add to from all over Australia / the world to get some funds built up – I’m definitely warming to that one! I’ve ranted about this several times and been given the same reason for it not being digitised – but its a major newspaper with the advantage of covering huge chunks of regional Victoria as opposed to the Argus which mostly covers Melbourne – i for one would be happy to contribute to a fund to get this paper online! We expect that the digitisation process will be completed by the end of the financial year and the newspapers will be available on Trove http://trove.nla.gov.au/ndp/del/home by the end of June 2012. Would it be possible to add Geelong Advertiser pages in groups, instead of in one lot? We don’t mind searching the first, say ten years, and then going back for more later. To say we were all “over the moon” at this news would be an understatement! Being very greedy, are you aware of any plans to take it past 1856 and also to fill in the gaps missing from the Ferguson Collection up to 1845?